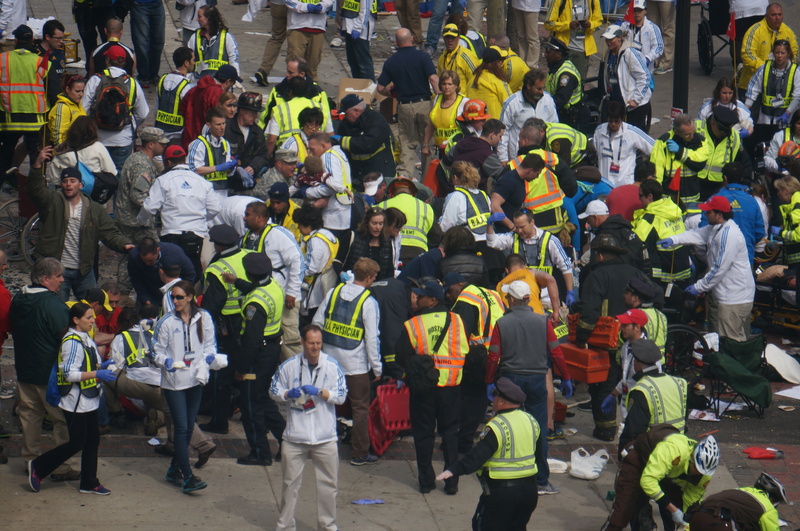 After the recent tragedies in Boston and West, many of us celebrated the incredible stories of first responders. These were the people who ran back into the fray after the explosions, who searched for bodies in the rubble, who sacrificed their own safety and security to give blood, clothing, medical care, and whatever else was needed. Truly, first responders are heroes. We love them. We Americans have a problem with first responders. See, after events like the bombings in Boston, we go nuts for them. We cheer them in the streets and even propose a National First Responders Appreciation Day. So why – oh why?! – do we also have something called the double-tap strike? The double-tap strike is a type of drone strike: after a first bomb hits, the drone drops a second missile right on top of the first. I guess this second missile makes sure the first one did its job; but it does something more: it kills the first responders who attempt to drag bodies from the rubble. As a result, no one wants to go near a drone strike. Survivors wait there too long to be saved. Families stall in terror rather than search for their loved ones. These attacks are so common they even affect the NGO teams on the field. Aid organizations and medical groups report as much as a six hour delay before entering the site of a drone strike. Hundred of civilians have likely been killed in these attacks. Human rights groups fear the strikes cause severe psychological trauma to the communities around the strike zone. They cite illness and disease related to stress, along with time missed from school and work as families huddle to avoid assault. Do you care about first responders? Did the inspirational stories from Boston and West move you? Then don’t execute the men and women who do the exact same heroic jobs in Pakistan, Yemen, and Somalia. ← Kiobel v. Royal Dutch Petroleum – a Blow to Human Rights?